Anthony is based at our Upton clinic. Anthony qualified at Glasgow University in 1970, He was then awarded a post -graduate Scholarship to work on wildlife diseases in this country, particularly zoonoses. . However, after finishing this project, government cutbacks meant that there was no paid work in this field. After a year working on fish diseases Anthony decided to enter general practice joining a mixed practice in Dorchester for 4 years. He then went to Canada to work in a clinic with very good large and small animal facilities. It was there that Anthony developed an interest in surgery of all types and particularly orthopaedics. He also did a large amount of equine work. After 2 years in Canada Anthony came back to Dorset and set up his own practice with hospital standard equine facilities. After 20 years this was sold off and Anthony spent time as a locum. 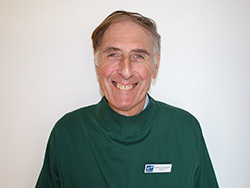 He worked in the Thame Vet hospital for 2 years, then came to Upton vets for 4 years, and finally settled in small animal practice in Weymouth for 11 years. After semi-retiring Anthony was asked to come back to Upton part time: this is now 3 days per week! Anthony works in Upton on Mondays, Tuesdays and Thursdays.